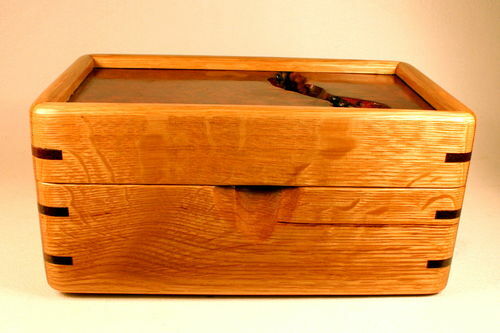 Pictured is a simple keeper box (11” L x 5” H x 6 1/2” W) with quarter-sawn White Oak sides and a Redwood burl top and corner splines. The top was created by spliltting a thick piece of bureled redwood in two and then one of the halves was flipped over. The live edge was then butted together in the dado made in the sides of the lid. 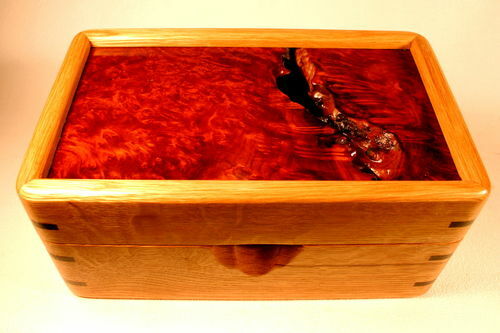 The sides of the box serve to frame and strengthen the Redwood burl. 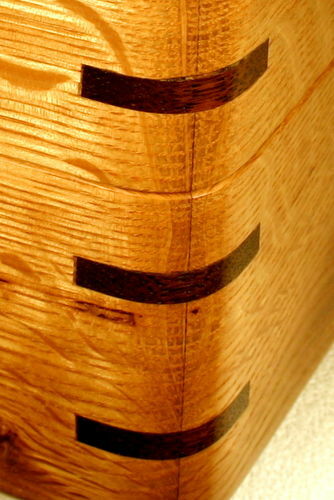 As many of you know, it is difficult to capture the beauty of the grain in wood with a camera. So I was surprised how well this close up photo of the top turned out. Steadying my camera on a tripod really makes the photos clearer. 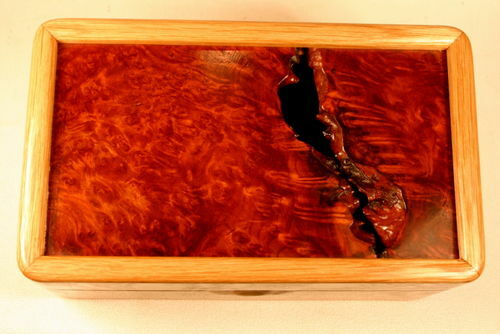 Story: I have been fascinated by the views of Hawaii’s Kilauea Volcano this past few weeks as molten lava flows from cracks in the earth’s crust It occurred to me that I could create an effect like those cracks by butting two sides of a live edge together. 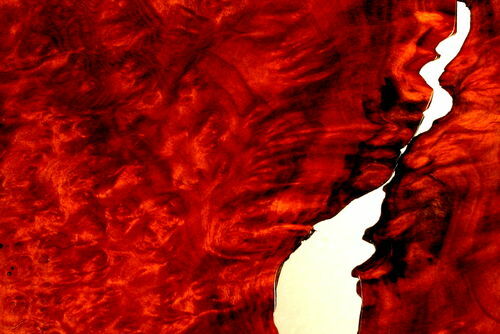 Redwood burl has a really wonderful grain and even a beautiful live edge pattern. (I did sand down the sharpest spikes in the live edge.) To stabilize the redwood I put about 20 coats of finish on the two Redwood pieces. It really soaked up the finish. I kept this Redwood on my finish table and every time I coated some other project I would put the last of the finish on this Redwood piece. I have notified the Center for Disease Control. It seems that Spline Fever is spreading and there is an outbreak now in Australia. LJ Rob has succumbed to this dreaded disease and so I am including this close-up of the corner of this box for Rob and Tooch hoping that just seeing splines might help build up an immunity so they won’t feel so compelled to build boxes with spllnes. Wow ! Beautiful box. You really know how to use your material. that top is awesome. Great job. This box is so outstanding and finely done. It displays your wonderful craftsmanship quite beautifully. Nice work, Al! Very Cool Al looks great and creative thinking, nice work. Very nice use of that piece of burl. Your craftsmanship is top notch. It occurred to me that I could create an effect like those cracks by butting two sides of a live edge together. Wow! Love this box! So Al I see you are thinking outside the box again. I love this idea butting two sides together to create the rough void on this box. This opens up so many new doors for all of us to explore. I love the look of those open voids. Your great idea’s come from brilliant thinking. Very Nice work! That is one beautiful piece of work! The simplicity of the White Oak really serves to set off the extreme beauty of the Redwood burl. It’s a very nice combination of materials. You mention 20 coats of finish. 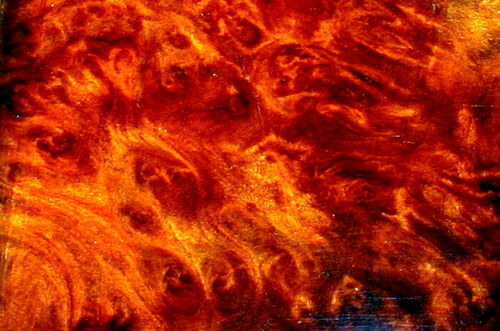 Did you use any dye at all or it that the natural colour of the burl? Great job! Beautiful color and clean looking splines…very nice! Great looking box, and the top is spectacular. Great job !!!!!!! Doug, thanks for the comment. You know how it is…there is some wood that you just can’t throw a way. You just have to find a way to use it. Serg, thanks for the comment I do try to use the wonderful scraps that come my way in any way I can. Horkey, Redwood burls are too precious and beautiful not to find some way to use every scrap. Charles, thanks for the kind words about craftsmanship and for noticing the subtle things. Jim, thanks. I don’t know if it is creative thinking exactly. Sometimes the wood tells me what to do. Sometimes I tell the wood what to do. This project was a little of each. Sounds weird, but its true in my shop. Minnesota Jim, Craftsmanship is a way I can honor the beauty of these woods. Brian, thanks for the nice comment on the story. Isn’t it strange how a number of ideas seem to just float around in your mind and then they come together in some odd way? Tony, thanks for the thoughtful comment. Necessity is ever the mother of invention. I was determined to find a way to make this small thick scrap into a top. It is such beautiful wood. Thanks, Dave. Your box swap project was certainly a success. I enjoyed seeing the creative ways LJs used wood. Thanks for doing that. Bill, this is the natural color of the woods. As a point of pride, I never use dyes. Aren’t we woodworkers blessed to be able to peer into the souls of trees and see the beauty Nature has hidden there? 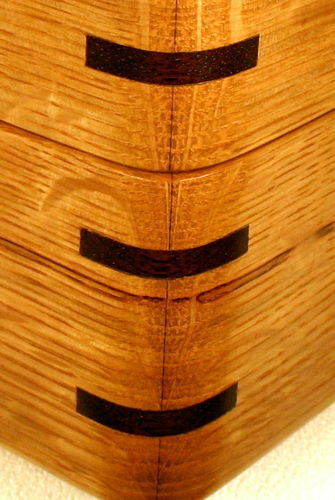 My boxes are a way of sharing that natural beauty with others. Billfish, thanks. Isn’t it nice to find this beauty in wood and share it with others. I like to think it is a way of extending the lives of these wonderful trees. Tom, thanks for the comment about the splines. The secret is to get the thickness of the splines to be just slightly smaller than the spline groove. I like to size them so they just slip back and forth in the groove. I also try to use them on the same day that I size them since wood has a way of changing with moisture. Mel, thanks for the nice comment about the look of this box. I have to give credit to Nature for giving us woodworkers such wonderful material to work with. Before the world was made of iron and steel, it was made of oak and stone.